Breastfeeding beyond the first year. When my husband and I decided that we would begin trying to conceive (TTC) the second time around, it never once crossed my mind that I should stop or discourage my son from nursing. I have many online friends who tandem nurse and ones that discussed dry-nursing painfully through pregnancies, but the thought never crossed my mind that nursing could be a roadblock on the TTC journey I was about to embark upon. I had some difficulty the first time around with TTC. We were about to make an appointment with a fertility specialist when I got my BFP (Big Fat Positive). I entered motherhood and put all of my TTC woes blissfully out of my thoughts and embraced attachment parenting and breastfeeding full force. We also made the decision to use an IUD to prevent any accidental new additions. It turns out that I did not need to worry about that because while breastfeeding, my cycle did not return. Oh – the bliss of not worrying about a cycle! We decided that we would begin TTC just after my son turned one. I called my obstetrician’s office to make the appointment and asked the receptionist to put a note in my file that I still had not had a cycle and I wasn’t sure if that was due to the IUD or the breastfeeding. At this point the receptionist told me that I would definitely have to stop breastfeeding when I got pregnant; it just wouldn’t be safe. A little wave of shock went through me and I made a mental note to talk to my OB about it, and then I tuned her out. At the appointment my OB confirmed what I already knew from the women in our community – yes, you can breastfeed while you are pregnant, and it is possible to get pregnant before your cycles return. So now I began to wait for my cycle. With each month that it did not arrive – I tested. I began researching TTC methods and tried to familiarize myself with all the ins and outs but without success. I had one large road block – I had no cycle so I had no starting point. I knew why I was not getting a cycle, but I was not willing to prematurely end my son’s breastfeeding. I had been using the “don’t offer, don’t deny” method, and he was nursing only a few times a day. This was our plan, but I did not think that it should mean that we could not continue to grow our family. I began to research methods to encourage a regular cycle. I looked at my weight and health, which were within normal levels, and I was eating well. Around that time an article about acupuncture and fertility written by Dionna for NPN came out, and I thought that if it worked for her I could give it a go as well. I tried to go through my insurance, but they only cover acupuncture for specific conditions and this did not fall under one of those three conditions. 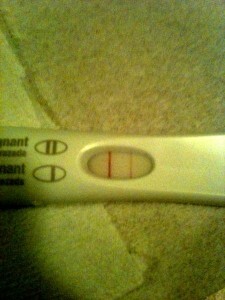 The long waited-for positive pregnancy test. I moved forward and found a practitioner and explained that I wished to maintain my milk supply but to balance my body so that I could have my cycle. He actually had to call his mentor to figure out which points would be the right ones for me. I went through a series and finally did get a cycle without losing my supply or cutting back on nursing. We still did not get pregnant right away, and my cycle never really regulated itself. But I decided to trust myself and my body and that I would know when it was time. We are currently expecting our second addition and anticipating the possibility of joining the ranks of tandem breastfeeding families. I will admit that there were many times that I resented breastfeeding because of its effect on my fertility. The love of my son and my knowledge of its benefits outweighed any thought of prematurely ending the breastfeeding relationship for us. Breastfeeding is a personal decision and should be continued for as long as mutually desired by both mother and child. I cannot say for sure that I would have indefinitely breastfed if we did not get pregnant when we did. I was admittedly losing hope. If you are struggling with fertility and breastfeeding, you should explore your options and carefully weigh your possibilities. Only you and your healthcare professional can decide what is right for you and your individual circumstances. This article is not intended to take the place of professional advice and should not be taken as such. Statements on this website have not been evaluated by the Food and Drug Administration. Products and/or information are not intended to diagnose, cure, treat, or prevent any disease. Readers are advised to do their own research and make decisions in partnership with their health care provider. If you are pregnant, nursing, have a medical condition or are taking any medication, please consult your physician. Nothing you read here should be relied upon to determine dietary changes, a medical diagnosis or courses of treatment. More articles from our volunteers who have nursed through pregnancy and beyond! Shannon R is a breastfeeding-cloth diapering-working-mother and devoted wife. She is expecting her second child in April. She blogs about breastfeeding, expressing at work and cloth diapering at The Artful Mama. Congratulations, Shannon! Although I don’t know if I would consider that a “long wait” considering your two kids will be just over two years apart. But I do completely understand how LONG every month feels while TTC! Good luck with the pregnancy and the adventures in tandem nursing! Sounds like your body was just spacing children as it needed. For most women who nurse into toddlerhood their children will be spaced 2 or more years due to how their body naturally responds to breastfeeding on demand. IMO, it’s not really infertility if it’s just delayed due to breastfeeding. I’m so happy for you and your new little-one-on-the-way! I know that any time we wait while TTC, it’s hard. I’m one of the “lucky” ones who gets cycles back within a few months but wants widely spaced kids — maybe I could have loaned my fertility out, lol.